Among Friends, LLC, is the creation of two friends, Suzie Miller and Lizann Anderson. Like many such ventures, it began over a cup of coffee (and involved a cookie, of course). This was a mouthwatering cookie, with memorable taste and texture, handcrafted by Suzie. That’s when I got out my wooden spoon. (I’m Lizann). I vowed to make Suzie’s cookies dense with nutrition without sacrificing great taste. We know firsthand about the perils of healthy cookies that taste like the cardboard they’re packaged in. You see, I was blessed with three boys and the middle one is a bloodhound who sniffs everything before he eats it. I knew if I made a cookie that passed the tyranny of Shane’s taste buds, I would have accomplished something. The imp will eat as many Suzie Q. cookies as I can keep in the jar (Needless to say, we’re mum with our kids on the benefits of whole grains). Among Friends mixes reflect our desire to share our baked goods with other discriminating palates. Our goal is simple: we want to help people fill their kitchens with fresh-from-the-oven baked goods made from the best ingredients. Our mixes make baking easy for people on those days when treats from scratch are impractical or well nigh impossible. We all have those days. Our name tells it all. Each of our baking mixes is handcrafted for friends and named for someone we love, a friend or family member. Velvety soft spelt flour combines with hearty oats, organic raisins, almond meal, and a hint of cinnamon for a memorable version of this classic cookie. Gluten-free whole grain rolled oats, gluten-free whole grain oat flour, light brown sugar, organic raisins (organic raisins, organic vegetable oil), cane sugar, almond meal, cinnamon, contains 2% or less of: sea salt and baking soda. 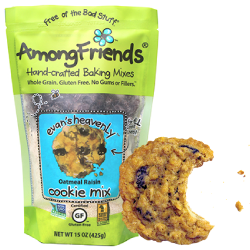 Among Friends Evan’s Heavenly Gluten Free Oatmeal Raisin Cookie Mix is amazing! I love oatmeal raisin cookies! I've been trying more and more gluten-free products these days due to my daughters gluten sensitivity and I've found most of the time the flavor is just a little off. However, that is not the case with these Among Friends Oatmeal Raisin Cookies. These cookies taste like homemade cookies and have a wonderfully amazing texture! They were incredibly easy to make and didn't last long in my house. Even my husband who isn't a huge fan of oatmeal raisin cookies loved them. If your looking for the perfect gluten free cookie then you'll love these! Even if you don't need to eat gluten-free you'll love them. They are just that good! Click HERE to locate a store near you that sells Among Friends Hand Crafted Baking Mixes! To learn more about Among Friends and check out their other baking mixes click HERE! Follow Among Friends on social media!